Senator John McCain covered a lot of ground in comments at a campaign event in Racine on Thursday. The Republican presidential nominee questioned the experience of his Democratic opponent, Senator Barack Obama, calling him "an impressive speaker." But McCain charged that while the beauty of Obama&apos;s words has attracted many people, especially young people, to his campaign, "on issues big and small, what he says and what he does are often two different things." McCain said Obama&apos;s plans would make the federal government larger than it already is. He said the debate about Social Security should be open, but raising taxes is not on the table: "I hope I can convince Senator Obama that&apos;s it&apos;s not a good idea to raise taxes on American families who are hurting today." Tax increases, said McCain, will inhibit investment in new jobs. "I&apos;m going to keep current tax rates low, and cut others," he said. "Not because I want to make the rich richer, but because it keeps jobs in America, and creates new ones." McCain also touched on nuclear power, something he said needs to be part of America&apos;s energy future: "we always want to imitate the French, right? Eight percent of their electricity is generated by nuclear power." McCain also boosted charter schools. "It is not so much that charter schools are that much better," he said, noting that some charter schools in his state had failed. "But, they provide the competition that increases the level and excellence of education in every school." McCain spoke to about 1,000 people at Memorial Hall in Racine. 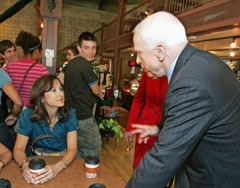 Prior to the event, McCain met ousted state Democratic Party delegate Debra Bartoshevich, her father and daughter, at a coffee shop. They then rode on the candidate&apos;s bus to the event, where he introduced them to the crowd.